With 800 home-cooking recipes, America: The Cookbook is a celebration of the remarkable diversity of American food and food culture state by state. Features 50 essays and menus from a 'who's who' of 100 foremost food experts and chefs. America: The Cookbook is the first book to document comprehensively – and celebrate – the remarkable diversity of American cuisine and food culture. A thoroughly researched compendium of 800 home-cooking recipes for delicious and authentic American dishes, America: The Cookbook explores the country's myriad traditions and influences, regional favorites and melting-pot fusion – the culinary heritage of a nation, from appetizers to desserts and beyond. A unique state-by-state section features essays and menus from a 'who's who' of 100 foremost food experts and chefs. Gabrielle Langholtz has travelled extensively throughout America and for a decade was the award-winning editor of Edible Manhattan and Edible Brooklyn. Previously, she was the head of special projects and publicity at the New York City Greenmarket and authored The New Greenmarket Cookbook. She resides in Pennsylvania, though has lived in many states. 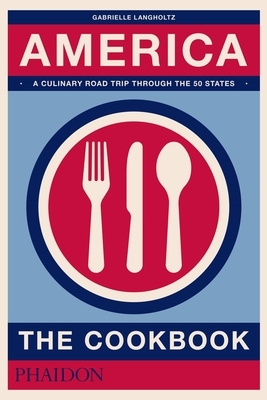 Contributions by 100 foremost food experts and chefs: Scott Peacock, Frank Stitt (Alabama); Christopher Nicolson (Alaska); Gary Paul Nabhan (Arizona); P. Allen Smith, Matthew McClure (Arkansas); Jonathan Gold, Alice Waters (California); Eugenia Bone, Holly Arnold Kinney (Colorado); Michael Stern, Gabe McMackin (Connecticut); Sam Calagione, Hari Cameron (Delaware); Norman Van Aken (Florida); Nicole A. Taylor, Hugh Acheson (Georgia); Rachel Laudan, Martha Cheng (Hawaii); Kevin Huelsmann, Kris Komori (Idaho); Paul Kahan, Stephanie Izard (Illinois); Jonathan Brooks (Indiana); Jeremy Jackson, Andy and Carrie Schumacher (Iowa); Carl Thorne-Thomsen (Kansas); Adam Sachs, Edward Lee (Kentucky); Brett Anderson, John Besh (Louisiana); Andrew Taylor and Mike Wiley (Maine); John Shields, Jeremiah Stone (Maryland); Corby Kummer, Barbara Lynch (Massachusetts); Ari Weinzweig, Anita Lo (Michigan); Winona LaDuke, Andrew Zimmern (Minnesota); Martha Foose, John Currence (Mississippi); Danny Meyer, Colby and Megan Garrelts (Missouri); Seabring Davis, Andy Blanton (Montana); Clayton Chapman (Nebraska); Alicia Barber (Nevada); Susan Laughlin, Alison Ladman (New Hampshire); Ian Knauer (New Jersey); Freddie J. Bitsoie, Jonathan Perno (New Mexico); Adam Gopnik, Melissa Clark (New York); Rachel Wharton, Ashley Christensen (North Carolina); Laura Shunk (North Dakota); Jeni Britton Bauer, Michael Anthony (Ohio); Lucas Dunn, Judy Allen and Valarie Carter (Oklahoma); Mike Thelin, Naomi Pomeroy (Oregon); Aimee Olexy, Greg Vernick (Pennsylvania); Chris Cosentino, Champe Speidel (Rhode Island); Matt and Ted Lee, Robert Stehling (South Carolina); Emily and Melissa Elsen, MJ Adams (South Dakota); Kevin West (Tennessee); Robb Walsh, Dean Fearing (Texas); Blake Spalding and Jen Castle (Utah); Seamus Mullen (Vermont); Michael W. Twitty, Sean Brock (Virginia); Renee Erickson (Washington); Brent Cunningham, Damian Heath (West Virginia); Christine Muhlke, Dave Swanson (Wisconsin); Jeff Drew (Wyoming).